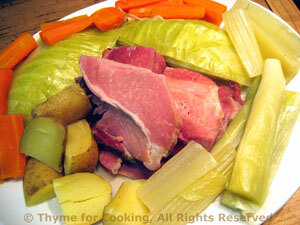 Sunday Supper: Corned Beef and Cabbage. This is the traditional Irish-American celebration dish for St. Patrick's Day. I don't recall seeing corned beef in Ireland during the year that we lived there. In Ireland it would be more commonly made with a slab of bacon or ham. And, to be truthful, I used ham as corned beef is not available here. Put corned beef in a large Dutch oven or pot and add enough water to just cover. Clean and cut carrots in thirds the long way, then in half. Add to pot, tucking around brisket. Cut celery into sticks, add to pot, tucking around brisket. Bring pot back to a boil. Then cut potatoes into quarters and add to pot, tucking around brisket. Cover and let cook for another 30 - 40 minutes, until the cabbage is fork tender. Remove everything with a slotted spoon. Serve half of the vegetables and refrigerate the rest for Hash or another use. Note: If using ham 1 tsp mustard seeds, 1 tsp peppercorns, and 1 tsp dried thyme to water.